The vocal quintet is made of young soloists who specialize in authentic early music performance. As such it is a part of vocal-instrumental body of The Czech Ensemble Baroque Orchestra & Choir that focuses on period interpretation of major Baroque oratorio, operatic and cantata works. The leading authority of the quintet is Roman Válek, the conductor. The core repertoire of the quintet consists mainly of madrigals and spiritual motets of 17th century (Montevedi, Arcadelt, Lasso, Byrd, Schütz). The style interpretation includes not only the musical part, but also period costumes worn at performances. 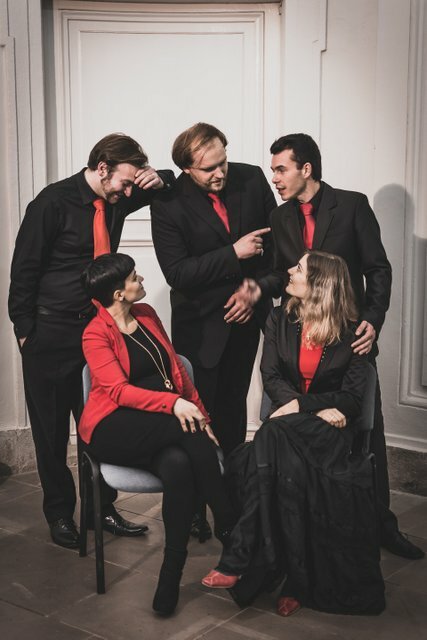 The Czech Ensemble Baroque Vocal Quintet repertoire includes among others also a new form of madrigals by Bohuslav Martinů and other 20th century composers or Lukáš Hurník. In 2017 Quintet made the first video for Monteverdi’s Madrigal Io mi son Giovinetta.